It is always great to get a short break and Ireland is great for a wealth of little spots you can get to in a matter of a couple of hours by car. Last Easter break we headed West to Co. Limerick. This year while the kids are off school Co Waterford was on the agenda. We chose a three night stay in the Park Hotel, Dungarvan. We had never been to Dungarvan but heard some great reports about the area. We loaded up the car and strapped the kids in on Good Friday. After hitting some Easter weekend traffic we arrived at our destination. Mission was then to keep the kids busy and having fun for the weekend. 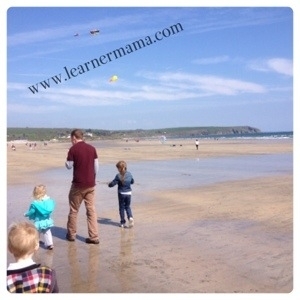 If you find yourself in Dungarvan with kids any time soon here are five things to do with kids – and even better they were all free. A short drive outside Dungarvan town centre is the blue flag beach of Clonea Strand. The weather was good while we were in the area (not hot but sunny and dry) so we took a spin to Clonea Strand. The views were just breathtaking. An amazing beach for a walk and I can just imagine in a few weeks if we get a spell of warm weather it would just be amazing to spend a few hours making sand castles and paddling in the Atlantic Ocean. We got an ice-cream and watched the world go by while the kids played in the sand. Okay we were slightly wind-swept leaving but a great spot to visit if you are in the area. 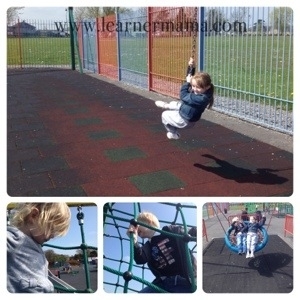 My kids love the playground and anywhere we visit there is always a quest to find a new one. There was an amazing playground just 2 minutes walk from the hotel. We headed off on Saturday afternoon and I was slightly nervous hitting an unknown playground on Saturday afternoon of a bank holiday weekend but it was half empty and the kids had a ball. Unfortunately the visit came to an abrupt end when my 2-year-old forgot about needing to go to the toilet and had an accident. She hadn’t had an accident in months – over excitement got the better of her! The town itself is a quaint little town and a nice one to take a stroll around. My kids loved it down by the harbour checking out the boats. For mum and dad there were plenty of bars and restaurants and we found ourselves in Moorings on Saturday evening for a bite to eat and a drink. Lovely atmosphere and nice food. 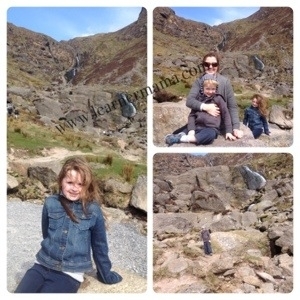 With the clear skies we decided to explore the wider area and took a drive to Mahon Falls. It was a fun drive to the car park just beside the falls – typical Irish country roads. Windy, narrow and hair-raising but breathtakingly beautiful views as we headed up the Comeragh Mountains. It is about 2km walk to the waterfall from the car park and my kids managed it no problem (well the 2-year-old took to Daddy’s shoulders). Really great spot. I would recommend bringing some warm gear as the wind was bitter on the walk towards the falls. Thankfully it had eased on way back to car and we had a pleasant return walk. As we were staying in the Park Hotel there was plenty to keep the kids busy back there. With a large swimming pool we had three swims over the course of the break and there was a kids club so we managed to rid ourselves of two of our three kids both on Saturday evening and for an Easter egg hunt on Easter Sunday. Always great to pick a hotel that has some things to do if you feel like having a few hours back at base. We are now home and the kids are totally wreaked. We are having a few chill out days before normal service resumes next Monday when school reopens. I hear Dungarvan is a great place but I have never been. The walk to the falls sounds particularly nice! Glad you enjoyed your break!